Officers of the State Forestry Corp. 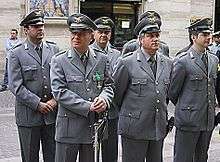 The State Forestry Corp (Italian: Corpo forestale dello Stato or CFS) is a national police agency in Italy. It was established on 15 October 1822 by Charles Felix of Sardinia as Amministrazione forestale per la custodia e la vigilanza dei boschi. The CFS has police powers and acts as a park ranger force responsible for protecting Italy's natural resources, the environment, countryside and ecosystems, especially national parks and national forests. It also acts as criminal investigative department and as typical police force. Its specialist duties include arresting poachers, investigating environmental violations, illegal building, counterfeit foods, safeguarding protected animal species, enforcing endangered species laws, and preventing and fighting wildfires through 15 regional commands and its fleet of 22 fire-fighting aircraft. It has responsibility for managing activities related to the Convention on International Trade in Endangered Species in Italy. The CFS is an agency under the jurisdiction of the Ministry of Agriculture, Food and Forestry. It is part of the Direzione Investigativa Antimafia (DIA) (Anti-Mafia Investigation Department). The CFS is also responsible for civil protection in Italy's mountain areas and for disaster relief. If necessary, the CFS can also be used in tasks of public order in the city and any urban context. The CFS's emergency telephone number for reporting forest fires is 1515. The CFS's vehicle livery is green with a white stripe and the words Corpo Forestale dello Stato in white along the side. The vehicle plates begin with the letters "CFS" in red.